If you have friends round for a midweek supper then this dish is ideal. It is quick to assemble and takes just 20 minutes to cook. Preheat the oven to 200°C, gas mark 6. Place the chilli and garlic in a small food processor or blender and mix until finely chopped. Alternatively, chop finely with a sharp knife. Add the coriander paste and lime juice and blend again for a few seconds until fairly smooth. With the processor running, gradually add the coconut cream and season well. Stir in the fresh coriander and set aside. 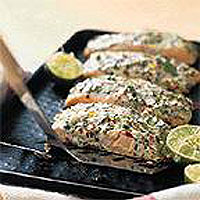 Place the salmon fillets on a lightly greased baking sheet and spoon over the coconut cream mixture to cover each fillet. Cover the tray with a sheet of foil and place in the oven to bake for 20 minutes or until just cooked. Transfer the salmon fillets to warmed serving plates and serve with Waitrose Thai Fragrant Rice. You could use any type of rice to go with this dish. Thai fragrant rice is very light and delicate but Basmati or long grain rice would work just as well. Stir in some chopped salad onions into the cooked rice for added flavour and texture. When cooking the salmon fillets leave the skin on as it keeps the flesh together during cooking.